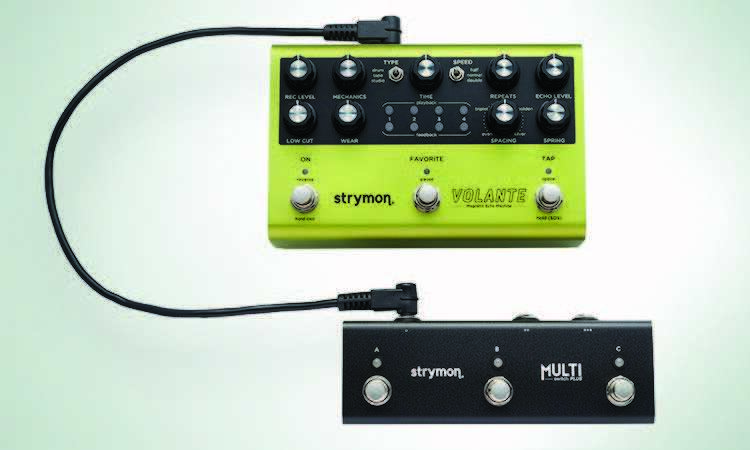 Near limitless sonic possibilities from Strymon! Volante is here. 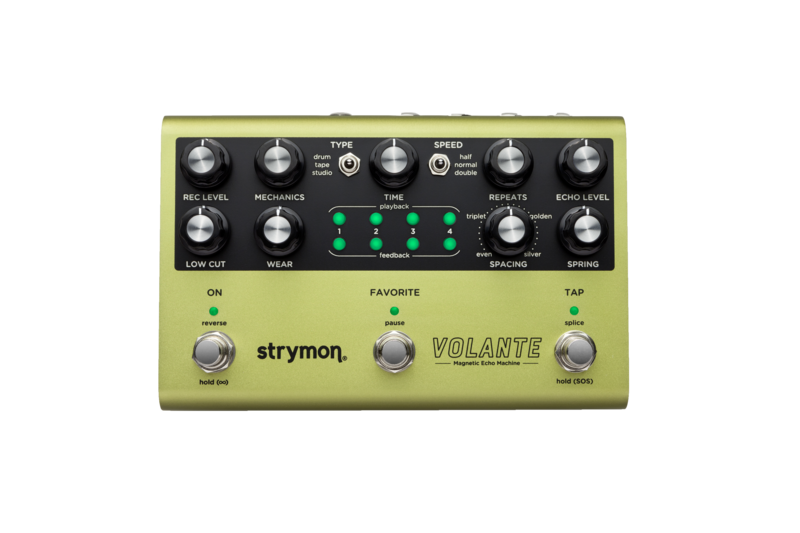 Volante by Strymon is a pedal poised to completely change your sonic landscape with a plethora of expressive effects and complete controls at your fingertips. Featuring magnetic drum echo, tape echo, and reel-to-reel studio echo, a stereo multi-head delay that is also packed with a looper and vintage spring reverb.  Powerful tools to bring your sonic soundscapes alive. Based on some intensive studying from the folks at Strymon these tape sounds and systems pay excellent homage to vintage classics, from the sound to the controls. Volante does justice to the vintage influences and predecessors. Get the full on experience and attributes on the board of multi-head echo machines! 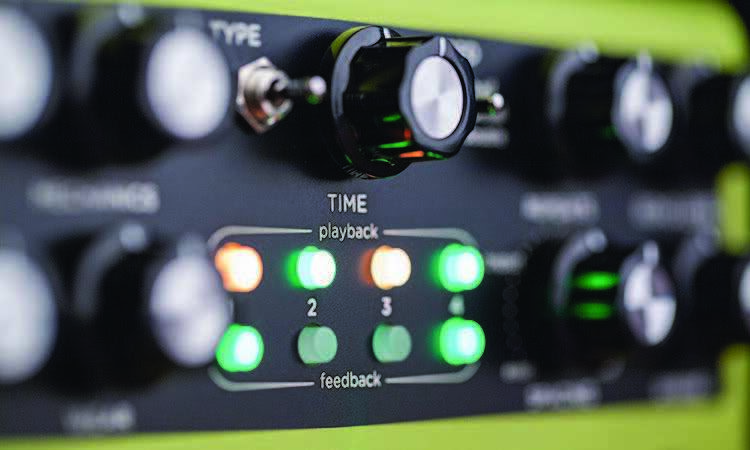 At the heart of the surface controls are four delay playback heads with individual feedback, panning, and level controls—a breadth of creative options right there facilitating a range of complex patterns and atmospheric sonic textures. Packed with tubes at virtually every stage, vintage drum echoes produce effects that are incredibly warm, rich and saturated, but with their extensive tube sets also came size, weight, and problems. The Volante offers meticulously crafted reproductions of some of the most beloved and sought-after drum echoes in a compact, durable package with an expansive control set for an infinite array of sonic possibilities. The Strymon Volante is designed to perfectly replicate all the characteristic imperfections and nonlinearities of vintage tape echo machines, but the Volante offers one thing those old machines can’t: stability. As rich and complex as the real thing, Volante harnesses the unpredictable sound and slow sonic degradation of tape, down to the crinkle, head wear, and irregular head spacing and mechanical alignment of the most distinctive vintage units, with total control. Just turn on Studio Echo, one of Volante’s three magnetic echo types, and this little box gets fat with the flip of a switch. Built to sustain the highest number of repeats with minimal degradation, Studio Echo mimics the reel-to-reel tape machines used by engineers in ‘50s and ‘60s to create unimaginably pure analog effects with full-bodied warmth and high fidelity reminiscent of full-range audio signals. 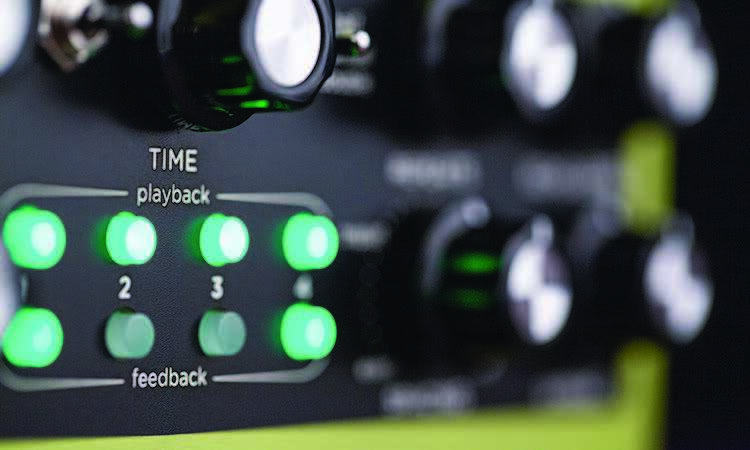 Set the playback level for each head at intervals of full, half or off, and move each head in and out of the feedback circuit, even if the heads are not activated for playback, without affecting the playback level. Create deep, rich rhythmic textures and heady multi-delays with complete control over each head and its place in the mix. As if fat, vintage-accurate tape echo delay with impeccable fidelity wasn’t enough, you can also crank up the saturation with the Record Level knob. Activate the class-A JFET preamp circuit to turn up the heat to the record head for extra analog warmth. 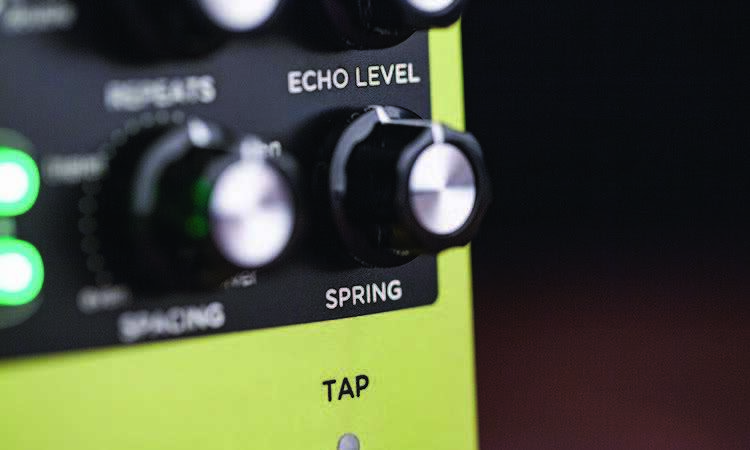 Strymon found inspiration in the small, integrated spring reverb tanks of old tape echo units and created a new spring-style reverb. 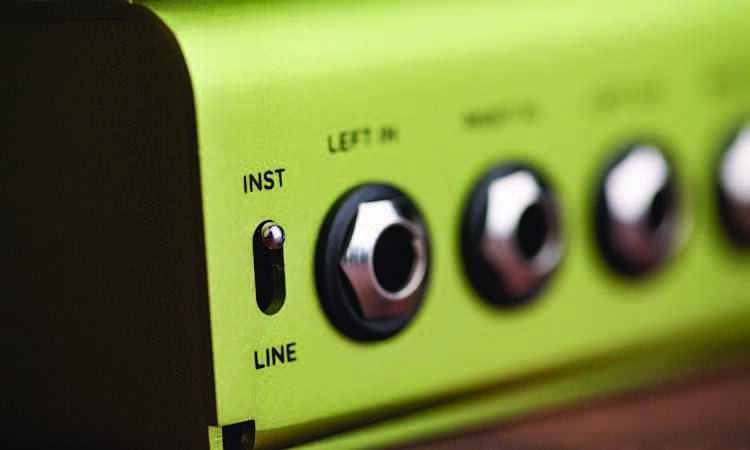 With a pure tonal character and nuance, use it to enhance delay signals or just on it’s own. It’s that good. Volante features onboard presets to store up to 8 of your favorite delay profiles, but hook it up to MIDI and that number expands to over 300. 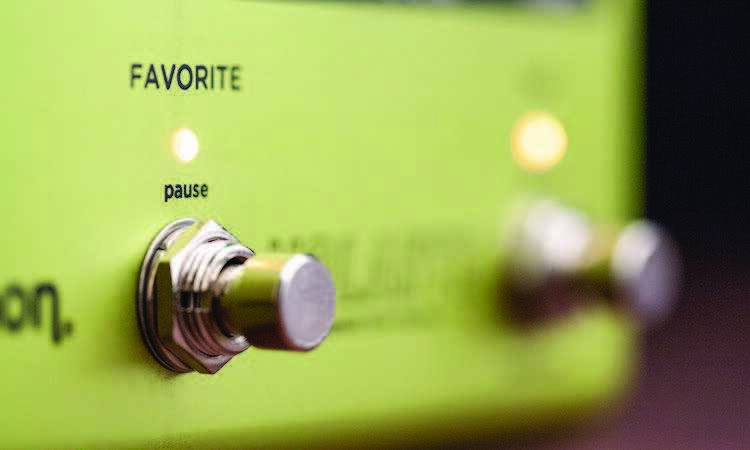 Never be without your favorite delay tones. Just store and recall for instant access to everything. The heads on many vintage tape echo units are unevenly spaced. This makes for shifting looping whenever more than one head is set to repeat. 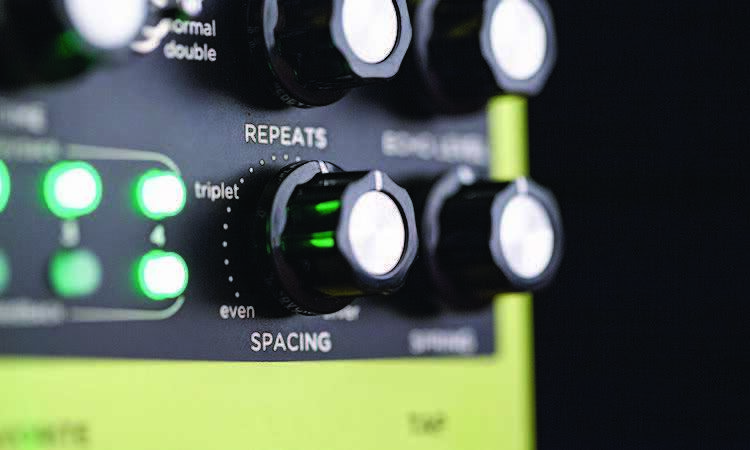 With Volante’s Spacing control, you can set the head distance to one of four presets or move the Spacing knob between presets for continuously variable, custom head spacing. Set the pan for each head individually to expand the stereo field and create new textural effects, or keep the heads at their default center pan for a beautiful, psychoacoustic stereo image. 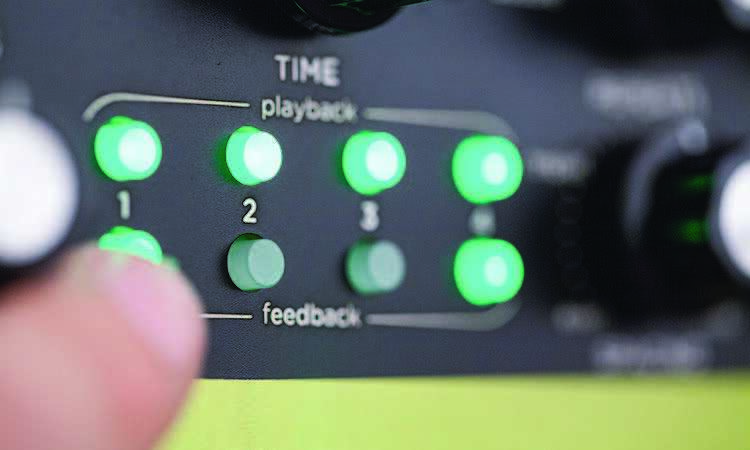 Volante puts feedback under your control. 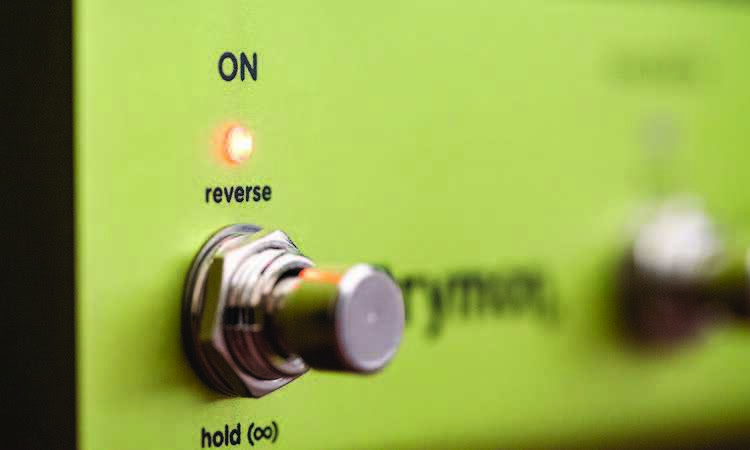 Turn up the Repeats knob and use the expansive control set to create thick, morphing, way-out madness that never gets away from you. Unless you want it to. 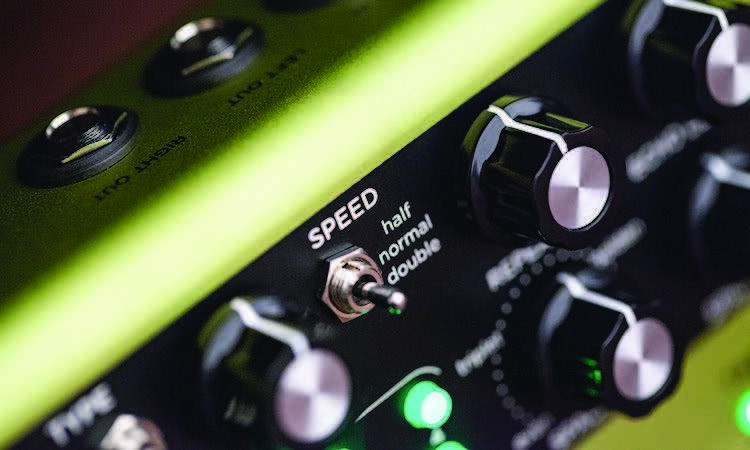 Use the Speed switch to set the individual recording velocity of each of Volante’s three magnetic echo machines. Select from half, normal, or double speed. The higher the speed, the higher the fidelity, but lower speeds offer more warmth and pronounced effects when introducing Volante’s vintage tape echo emulations with a turn of the Mechanics knob. Press and hold the ON footswitch when you’re in Echo mode and activate Infinite Repeats. 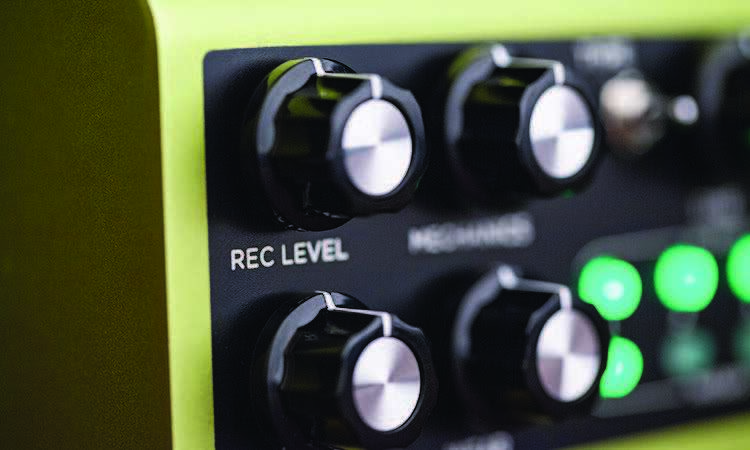 Whatever your current Repeats setting, Volante bypasses it to turn up the echo regenerations for intense, compounding delay. Just take your foot off the ON switch to return to Earth. 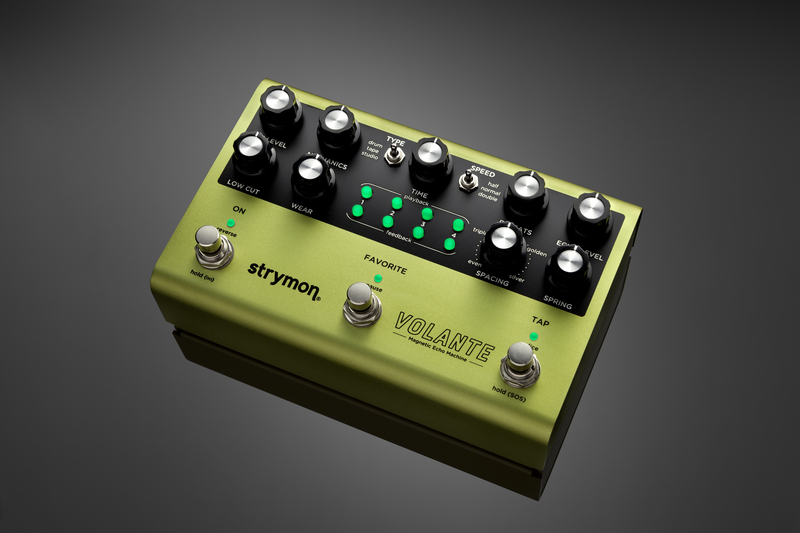 Use Volante’s incredible controls to change the direction of your loop, stop and start it at will, or speed up or down while changing the pitch simultaneously. Whatever you sound you’re looking for, once you have it Volante lets you lock it down with Sound On Sound to keep your echoes intact. 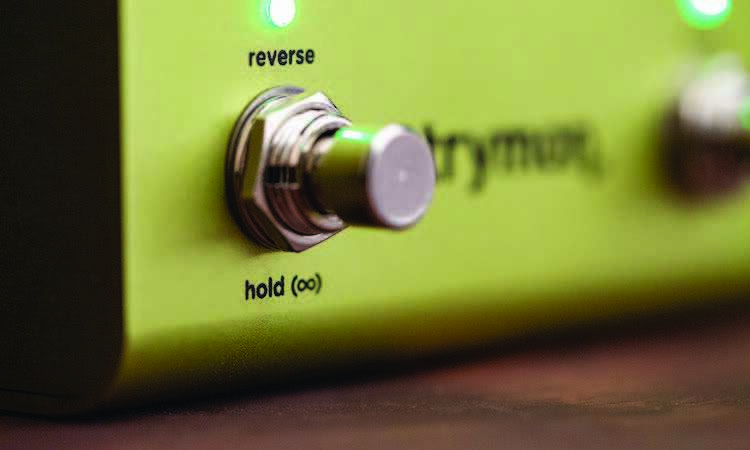 Switch on the Infinite Repeats to move it from the loop record head for infinite playback without degradation. Once you’re in Sound On Sound mode, hit the ON footswitch to reverse the entire loop while you continue to record new audio. 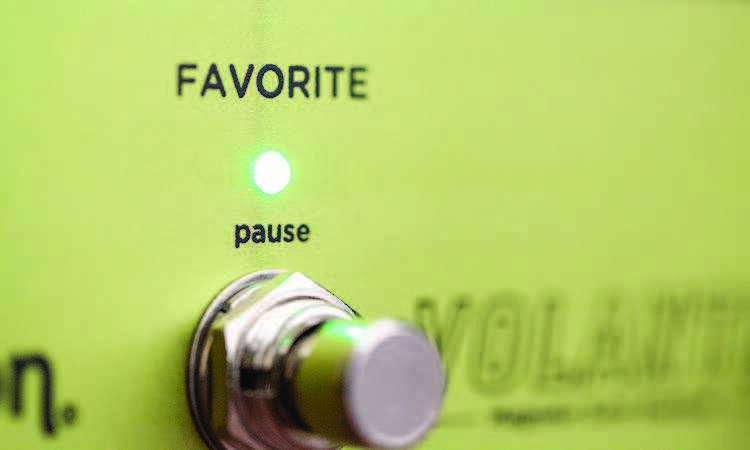 Volante’s Pause footswitch replicates the mechanical slowdown of vintage, variable speed magnetic echo units. Completely user-definable, this feature offers customizable slowdowns and startups with true tape sound. Enabled for full MIDI control of every parameter and equipped with 300 MIDI-enabled presets, Volante is the new centerpiece for your MIDI pedalboard. 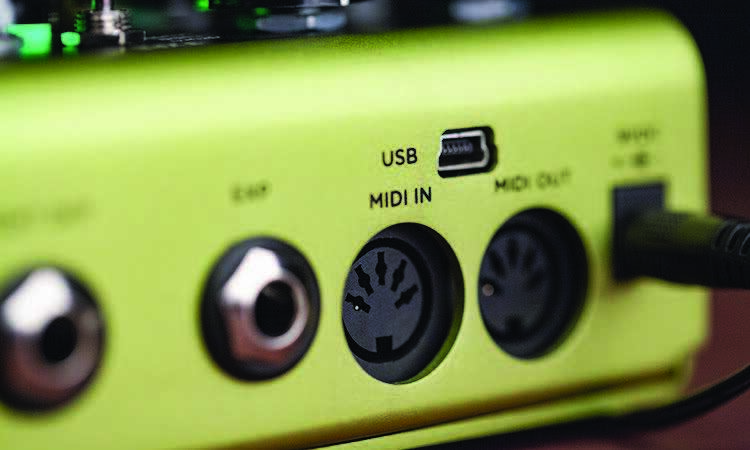 Transmit and receive MIDI three ways–over a 5-pin DIN, via USB, or through the Expression jack (via 1/4” to MIDI cable)–for unlimited possibilities on stage or in the studio. 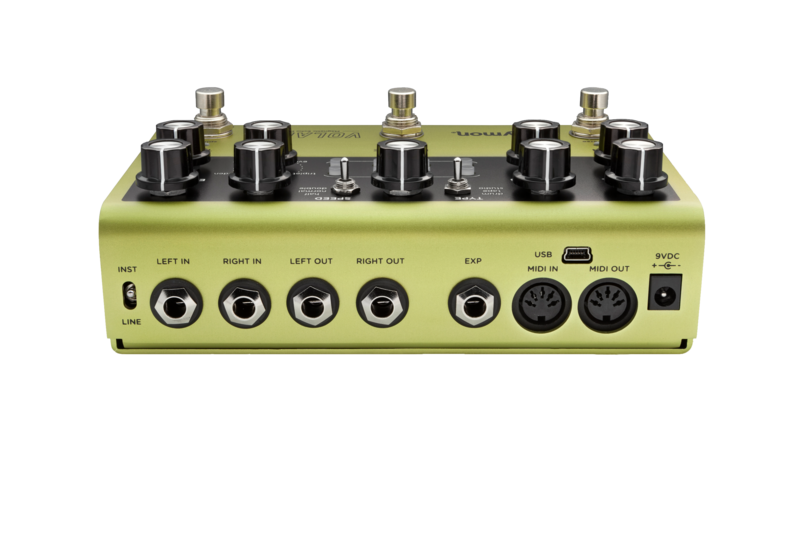 Plug in an expression pedal for even more control over Volante’s full range of effects parameters. Choose your settings for the heel and toe positions individually and experience these settings automatically change as you move between both positions. 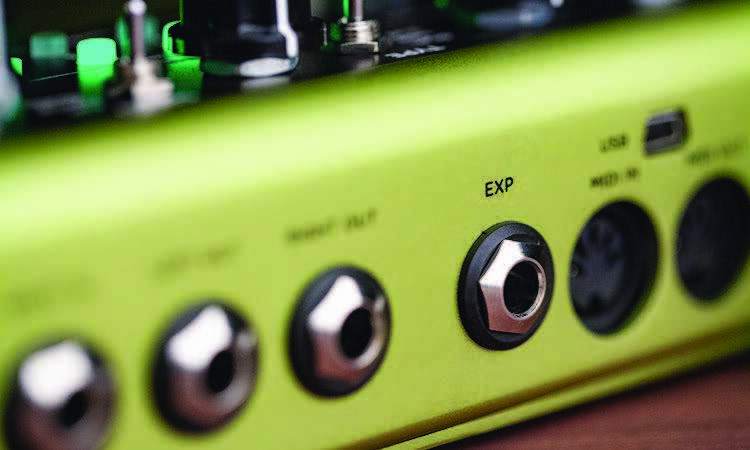 You can plug just about any studio tool you’ve got into Volante with the input level switch. Flip it to INST when you’re using a guitar level input and LINE when you’re using it in the effects loop or when plugging in a hotter output like a synth or a mixer. Use MultiSwitch Plus to control Volante’s Speed switch, transport, three presets, and additional controls when in Sound On Sound mode. 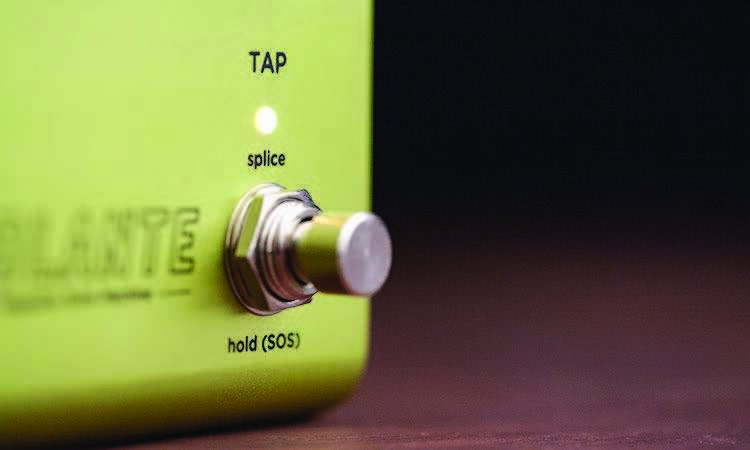 Just plug it into the Expression Pedal jack for hands-off selection and manipulation. to MIDI cable, or MultiSwitch Plus.